The new Civic Type R has been subject to one of the most drawn-out launches in automotive history. However, after two years of teaser images, videos and prototypes, Honda’s 167mph hot hatch is finally here. So has it been worth the monumental wait? Clearly, the third-generation Honda Civic Type R has a lot of hype to live up to, but the marketing spiel hasn't been without (at least some) foundation. 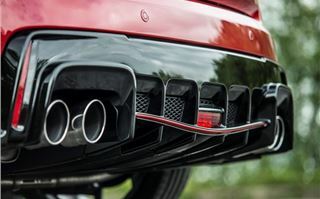 Indeed, the new Type R - which is built in Britain by the way - has been thoroughly reworked, with high performance mechanicals and a new turbocharged 2.0-litre petrol engine, producing 310PS - more than any other front-wheel drive car on sale in the UK. This means the new Type R is fast. Very fast in fact. The 0-62mph sprint takes less than six seconds and top speed is a whisker short of 170mph. The Civic is also packed with torque, with 400Nm available from just 2500rpm. Obviously, channeling so much power through the front wheels isn’t without its problems, ask any Ford Focus RS owner, but Honda has worked hard on taming the handling and torque steer with some significant upgrades. Power is delivered to the front wheels through a limited-slip differential, in conjunction with a dual-axis strut, which reduces torque and improves cornering grip and high speed stability. A Brembo brake package is standard too, with 350mm drilled front discs (the largest ever for a Civic) which means you can bring things to a controlled halt, should you overcook it. 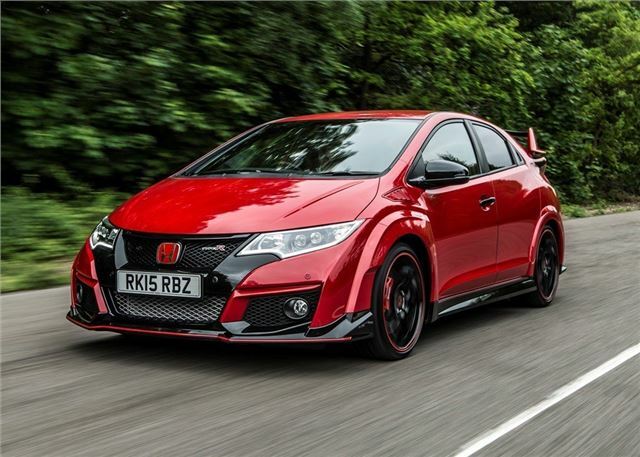 In addition to the high performance powertrain, the Type R gets a comprehensive aerodynamic package, which includes a front splitter, side skirts and huge rear wing. Honda tells us the bodyshape is necessary for high speed stability, downforce and heat dissipation. Which is just as well because the exterior will prove divisive. Inside things are somewhat more Civic-like, with plenty of head and leg room for four adults and a useful 498-litre boot. There are some Type R reminders though, notably the abundance of red stitching and cloth sports seats in the front. 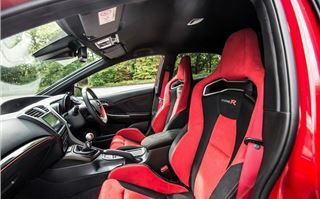 An alloy gear knob is also included, for the six-speed manual gearbox, although there's no automatic option available as Honda says this will dilute the Type R's 'racing car for the road' philosophy. Make of that what you will. On the road the Civic Type R is as entertaining as it is theatrical. 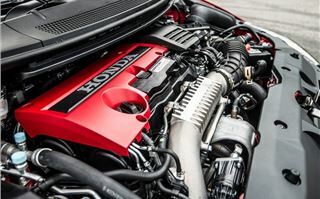 The four-cylinder engine is vocal and powerful while the handling is predictable and kept in check by the limited-slip diff and sports suspension. That's not to say that torque steer has been completely eliminated - it hasn't - but it's less intrusive and more manageable, with the occasional tug on the wheel under hard acceleration. 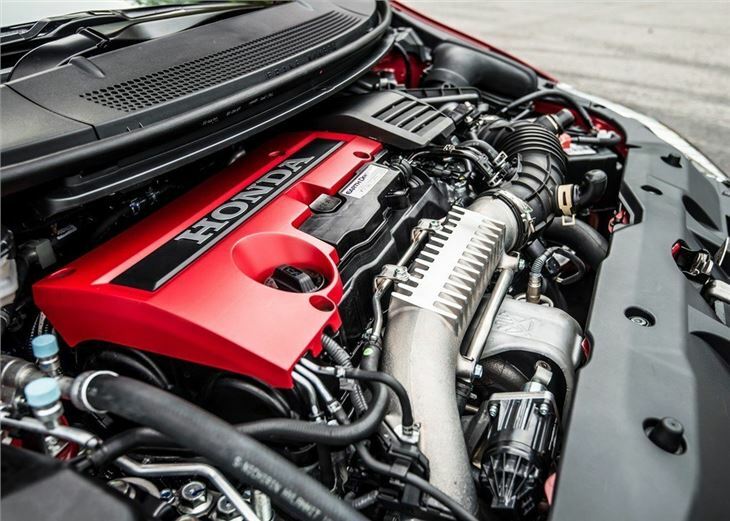 As a result, the Type R is an extremely easy car to drive quickly, with excellent handling and minimal turbo lag. Little effort is required to rattle through the short shift gearbox in a matter of seconds. We quickly grew to enjoy the free flowing revs and torque, while economy is manageable, with a claimed 38.7mpg and 170g/km of CO2. Performance can be improved by pushing the +R button, which turns the instrument display red and sharpens both the steering and damping. The +R function doesn’t make the engine rev any higher, but the car does feel a lot more capable and focussed, with a sharper turn and more feedback through the wheel. 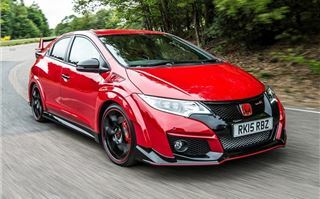 As well as being the fastest Honda Civic Type R ever built, this model is also the heaviest, carrying 1382kg. To be fair, that's only evident when pushing the car hard, but it is noticeable in corners and under heavy braking. However, this is nit-picking in what is otherwise a superb hot hatch. 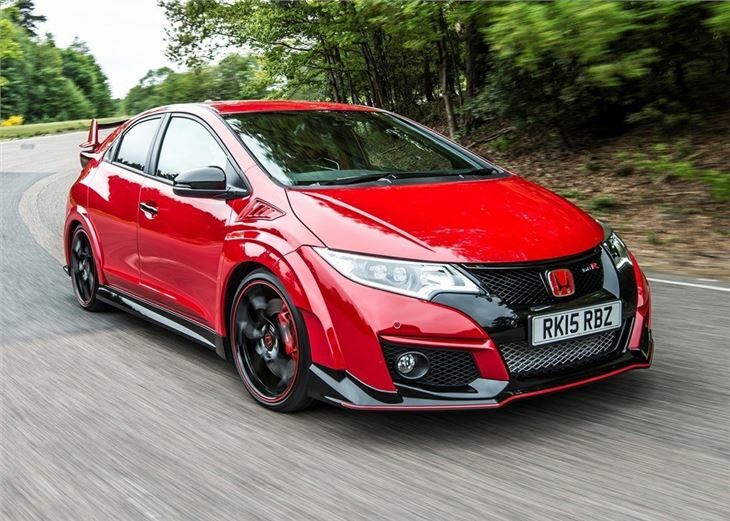 The only true criticism that can be levelled at the new Honda Civic Type R is in the styling. 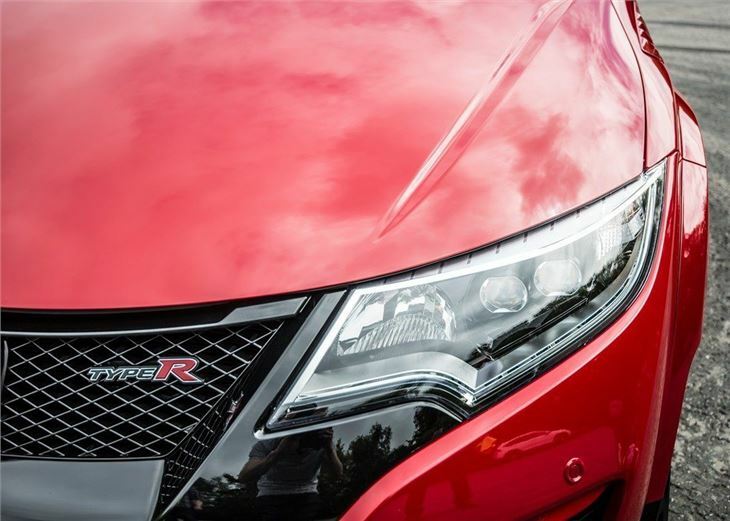 The aggressive shape and aerodynamic package will not be to everyone's tastes and some will simply avoid the Type R because of its looks alone. 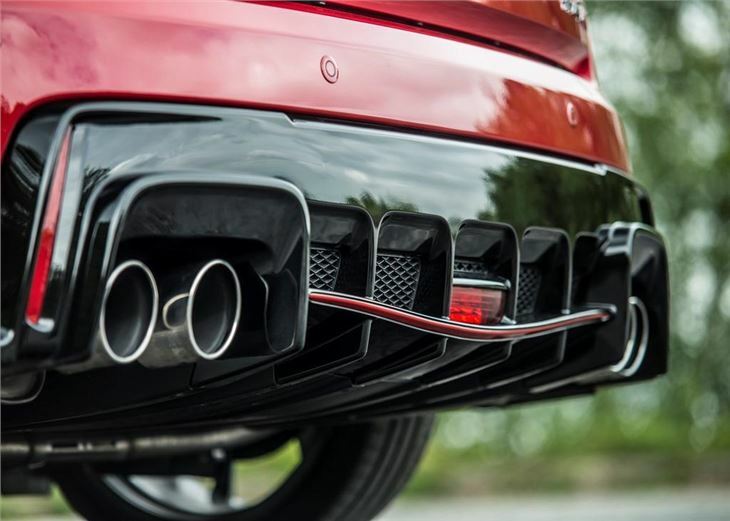 Equally, some will find the quad exhaust to become tiresome, with its loud drone ever-present on a long motorway run. 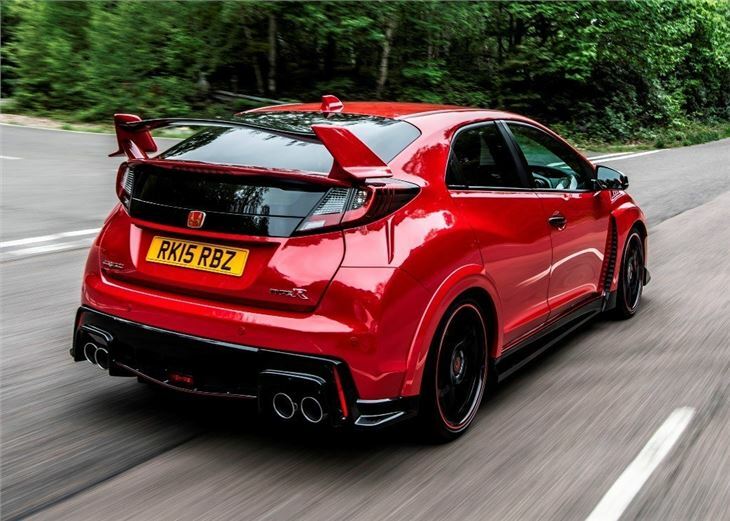 Yet, regardless of your view on what a hot hatch should look or sound like, there's no denying the technical brilliance of the new Civic Type R. It's easily the fastest front-wheel drive production car on sale in the UK and marks a huge step up for Honda’s R brand. 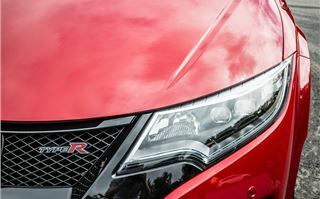 In fact, it marks a welcome return to form and few rivals can match the new R for character or performance. 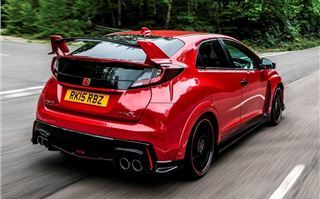 Priced from £29,995 - a few hundred pound less than a Volkswagen Golf R - the new Honda Civic Type-R goes on sale in July 2015.